The traditional role of CIOs and the organizational infrastructure beneath has collapsed. The cloud “raptures” all the communications and electronics equipment responsibilities and cloud service provisions to the cloud service provider, relieving CIOs, somewhat begrudgingly, of these responsibilities. CIOs…your 3-digit abbreviation now finally makes sense. You have been left with all that remains – The entirety of information your organization has ever created and ever will create. (As you have been from the beginning!) Welcome! Your organization’s data and information desperately needs your oversight and there’s no time to waste. For one thing, Part I. Goal I: para. 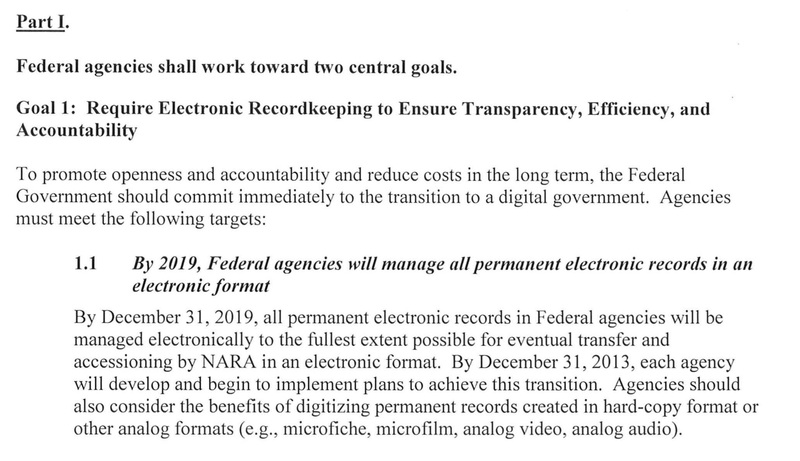 I.I of OMB m-12-18 states that by December 31st, 2019, you will be required to have all of your organization’s “official” government records managed electronically. Every government-generated keystroke will eventually be accounted for in the dawning online personnel management environment. The near future holds the ability, with the help of cloud technology, to monitor every online second of an employee’s workday. Online performance will be measured as a career objective. Agency funding will be tied to the graph of personnel performance. All of this information is your responsibility until it becomes a record. If it can be a record, it will be one. Yes, it’s absolutely true that this law has no teeth – no agency funding will be withheld and no one’s going to jail if it isn’t met…but, listen…some government agency out there is going to make the 12/31/19 deadline and begin providing the efficiencies demanded in the “long term” objectives of the OMB Directive. After the deserved attention is given, in a relatively short period of time, your agency will begin receiving instruction on how to structure data and information. No longer will you be allowed to just ignore it, nor will you have a voice in how it gets done. You might even have a plan for the creation, disposition, storage, accessioning, etc., of “official” electronic records. Great…but it’s not enough. You’re also responsible for every bit of your organizational, unstructured, non-record, user-created information and data across the entire enterprise. How do you manage THAT???? Who’s to say? Imagine if these unstructured data were demanded under a FOIA request or in legal evidence discovery? For posterity – taxpayer dollars pay for every piece of equipment and every salary in the government and every government keystroke generated…why can’t someone now, or in 100 years, submit a FOIA request for…say…any government organization’s shared drive folder structure and metadata schema (which anyone who’s ever worked in a government agency knows is a complete unstructured nightmare)? Why would someone want that? I don’t know why. That’s their business or the business of someone 100 years from now. The point is, a U.S. citizen certainly has the right to request this or any information, structured or unstructured, and if it were requested and no good reason prevented them from having it, how would you as a CIO provide it to them? How would you deliver in response to the FOIA request? How would you, right now, provide just the folder structure of your shared drive tree-structure in response to a legal discovery subpoena? CIOs…you need to hear and understand this point…! Control the storage of your data and information! As information becomes more valuable as a strategic asset, its protection and permissions management are key. Where do you put it and how best can you structure your data and information for security and whole list of other demands information warrants: Collaborative-ability; re-usability; interoperability, spectrum analysis, et al? Most importantly, how can organizational information be leveraged to the benefit of the organization? For every bit of this information, both records and non-records, follow the guidance of the National Archives! It doesn’t matter if non-records don’t warrant this level of attention. For the information demands discussed above, there’s no knowing what may or may not someday be a record. 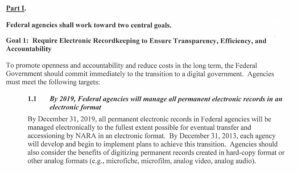 Besides, NARA has done much of the work for you – the benefit to your organization is that it will now have a single standard by which to manage its entire inventory of information. Call if you need some help. This entry was posted in IT-IM. Bookmark the permalink. ← GovKM.com – Which Government Information Needs Management?